Recently I was prompted to make a change with how my youngest daughter was doing her personal scripture study. Spiritual preparation is needed to weather many of life's challenges, and I want her to become immersed in the scriptures so her faith in Heavenly Father and Jesus Christ become stronger. When she was younger, we would read to her each night from one of the four LDS Scripture Stories; The New Testament, Old Testament, Doctrine and Covenants, and the Book of Mormon which you can purchase at the LDS Distribution Center. When she finished one book, she would go on to another. The books are $6.50 each and come in many languages, but there is also a DVD set of all four for $7.25. You can also view them online for free at the lds.org Media Library, or The Mormon Channel. 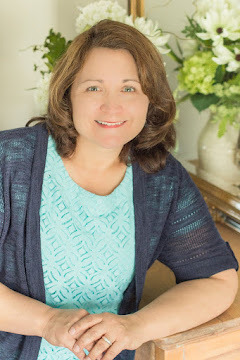 When my daughter first became an independent reader, I wanted to find a study method that would help establish the habit of life-long personal scripture study. 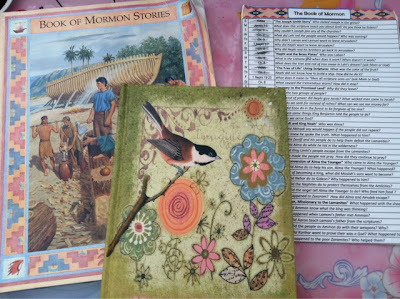 So I created a scaled down version of an idea found at Latter-day Homeschooling which incorporates the use of a scripture journal and the LDS Scripture Stories. For my daughter, I also included a few coordinating scripture mastery verses (you are never too young) and some of the Living Scriptures videos. We already own all of the videos. I found her a lined journal at Ross for $3.00. Each night my daughter follows a scripture chart I created for her with each chapter or verse to read. I printed it front and back on card stock paper. I taught her what each abbreviation means. Abbreviations are something new to a 7 year-old. 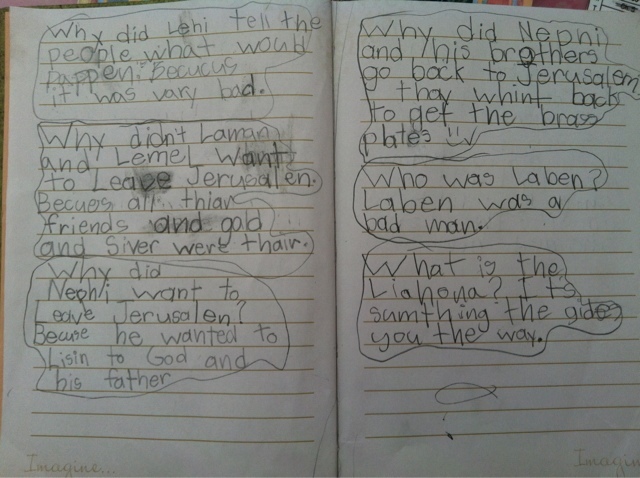 Then she answers a simple gospel question in a journal. On Sunday she can watch a correlating scripture video. I even included the movie, "The Testaments of One Fold and One Shepherd." She is free to respond as she wishes and spell as she can. I love it! This will certainly be a wonderful memory. You could adapt my idea for younger children by following the chart and reading to them. Then asking them the questions. But I think many grade school children of various ages could use my scripture chart. This is a great back-to-school, back-to-the scriptures gift idea as well. So far I've only created the scripture card for the Book of Mormon and the New Testament. But it's working! She understands what to do. I tried to keep the questions fairly simple. You are welcome to download the Book of Mormon scripture chart below in pdf and Excel. It takes about 11 weeks to finish the cycle. I hope this post will trigger some ideas for you. You may also like my New Testament Scripture Chart. Sorry, but these are the only ones I made. My daughter is now studying from Discover the Scriptures products. This is fabulous! I am planning to adapt this idea to use as our family scripture study--we have been very inconsistent and need help! This journal will be great for my 7 yr old, but I am planning to put together a corresponding coloring book for my 4 and 2yr old. Hopefully giving them a writing/coloring task will help them all to sit still while we read. Thanks! I have a 3 year old--obviously he's a little young for this, but it's an idea to tuck away for a few years down the road. What a great idea! My son turns 8 next month and I would love to do this for him and his older sister.